I’m excited to be adding custom dolls to my shop starting in January 2018. I love collaborating and since I work alone this is a great way for me to get another cook in the kitchen. I don’t have a very strict process or a lot of rules for doing custom orders. Please contact me through the form below and we’ll get the ball rolling. All customs will start from one of my basic doll designs. Check out my instagram feed, sewing patterns or the gallery of dolls to find examples. From there we can talk about additions, alternations, details, etc. I have lots of materials on hand and will send options from which you can choose. You can be as specific or as general as you’d like in the form. Once I get your request I’ll reply back on whether it seems like a match! Thank you! Cost will vary, depending on details and if I have the correct materials on hand, but will start at $135. 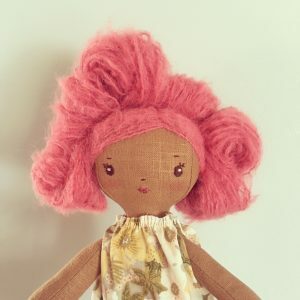 Wee Wonderfuls original handmade dolls are not intended for children under 3. There are handsewn parts that could come unattached and become hazardous. Spot clean as needed.